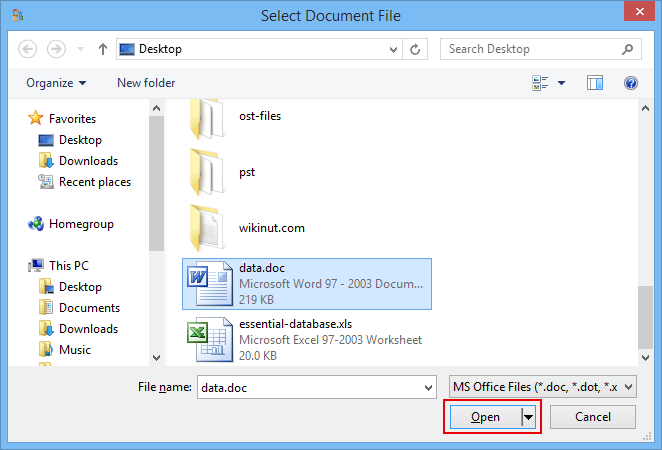 Supports all Office files types: .doc, .xla, .xls, .mdb etc. 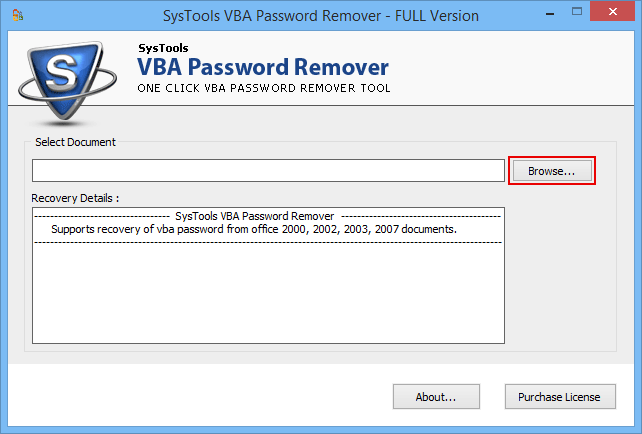 The software smoothly removes the lost or forgotten password from browsed VBA project file. In case, users have forgotten the password of secured VBA file then, they can leverage for this tool. VBA Password Remover is having a unique feature of generating a password, just after removal. Basically, the software does not make file fully unsecured but, keep file secured by password regeneration. The software is originated with high-tech technicalities supporting password of infinite length. Any combination of text, symbol, number, etc., is supported by our utility effortlessly. 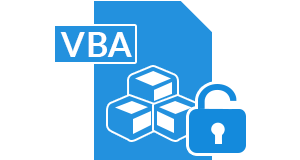 VBA Password Breaker is capable of eliminating security from any type of VBA project. All the files used by a VBA application for project creation are easily supported by our utility. A person can even extract the source code that are multilingual. It means that password created from special symbols and alphabets are removed by this software. At the completion of entire procedure, VBA password remover originates a CSV report. This report details users with complete techniques followed by the software for resetting. Is there availability of VBA Password breaker for free? Yes, the software is available for free but, with few limitations. It generates only first 2 characters of the new password. For testing you can utilize it and once you are satisfied, purchase product for complete recovery. 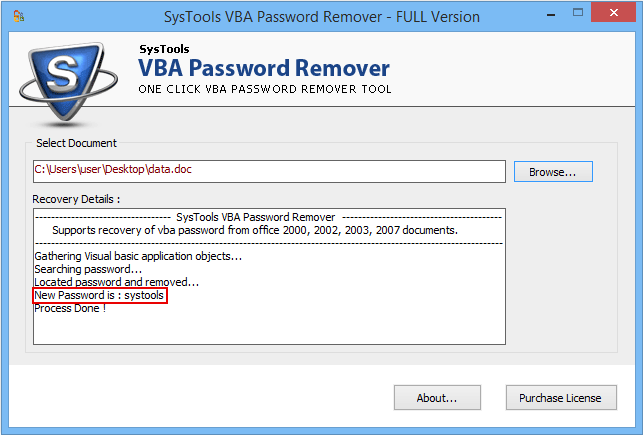 Will your remover support recovery from VBA password project of MS Office 2007? No, till now our software does not support file of Microsoft Office 2007, 2010 or above. It is capable of working with versions like XP, 97, 2000, 2003. Will you software provide old password of the browsed file? No, instead of providing the older password, the VBA password remover will generate a new password. Later, you can change this password as per your preference. Does your vba password retrieval software supports bulk file for processing? No, at one time, you will be able to remove password from one file only. 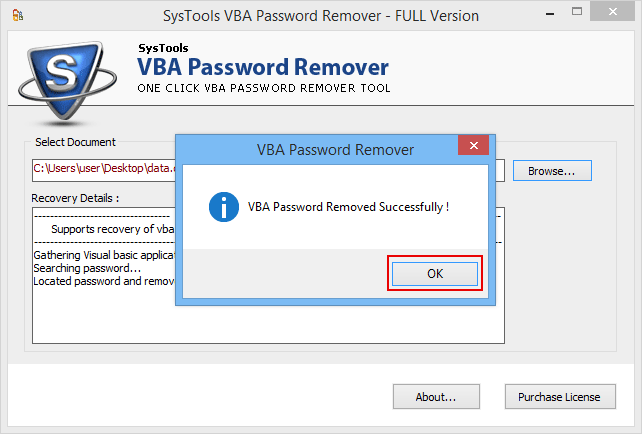 The tool does not support removal of password from bulk VBA file at a time. Can I recover password from an Excel worksheet in which Macro is enabled? Well, the basic functioning of remover is to recover password from .xls, .xla. .doc, .mdb, and .odt. For .xlsm file, you need to contact with our support team. Is your software compatible with Windows 10 operating system? Yes, VBA Password Breaker is compatible with Windows 10 and its all below version. On the software panel, you will found the newly created password of the software. Write down that password string and then open the browsed file with that password. "Without giving any debate, all I just want to say is that this VBA Password Breaker is 100% perfect tool for recovery approaches from VBA projects. Complete procedure is taken under high security without any hassle. It is just two click solution for users looking solution on how to get rid of VBA project password." "A brilliantly designed application to work with! This software helped me a lot in overcoming from the situation in an effective manner. Just a few months ago, I created few of my projects in VBA but, I lost password of the source code. Anyways, forgetting those bad moments, thanks to this software which now made me happy and relaxed."